This final warm-up video shows the full program with all three parts of the program: blood flow, mobilization, and power preparation. Why should you warm-up anyway before strenuous exercise? Warming up your muscles and joints will not only help you avoid injury, but also it will give your body a chance to peak perform. Instead of elongating your muscles, or stretching, before your next event, try to mobilize your muscles and joints. Squats, lunges, and balance reaches are the best combination to mobilize your lower body muscles and joints. The punching matrix is a great way to mobilize your upper body muscles and joints. You will know when you are adequately warmed-up when your skin is moist and you can run at top speed freely. Here is video of the Advanced Warm-Up program. Be certain to have the beginner and intermediate warm-up moves down before you add these high intensity steps. Next week, I will be showing you the entire program in a concluding video of our warm-up exercises. 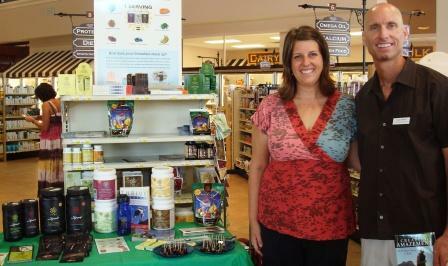 We just returned from a wonderful weekend in Atlanta. We picked up our Nigerian visas at the Nigerian Consulate on Friday. Then I attended The MidSummer Music Festival for one of my sponsors, Sigvaris, the global leader in Graduated Medical Compression – their new line of socks can be found at www.AthleticRecoverySock.com. I was doing a “meet and greet” at the expo. I had the opportunity to meet some of the dedicated Sigvaris staff as well (as their North american base is in Peachtree City just south of Atlanta). 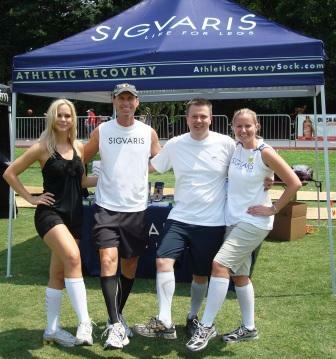 Here is a photo below at the expo (left to right) with 790 The Zone model Ashley and me with Clay Walker and Melissa Gwozdz from Sigvaris – all donning the Sigvaris Compression socks. This is our last full week in Florida as we depart July 1st for our “Around The World In Less Than 30 Minutes.” Final preparations are under way. We are excited to get things started in North America on America’s Independence Day! Our warm-up series continues at www.OneMileRunner.com with the addition of this Advanced Power Preparation video. These are the final bounding exercises added to your beginner and intermediate programs. These plyometric drills, bounding exercises, are an integral part of your warm-up program. The exercises are not something you do once in a while, but before every speed activity. Enjoy the workout! We ran a time trial half-mile this morning as we practiced the start of the Boom Box Mile on July 4th (race #1 on our tour of the world). I ran a 2:19 half which would be ;great beginning for the race as third quarter is a long incline and will slow you down. We travel to Atlanta this weekend on behalf of Sigvaris to be a guest at their booth for the Midsummer Music Fest June 19th from about noon-4pm at Candler Park. Please come on out if you are in the area!